DIY worm bin made from polystyrene boxes with some fresh bedding ready for compost worms to inhabit. My family produces more food scraps than the average worm farm can handle. So I decided to create a second worm bin using recycled materials for free. 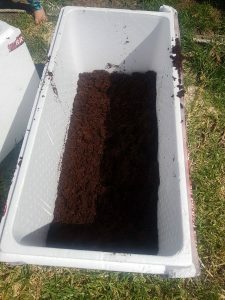 Creating a DIY worm farm using polystyrene boxes is an affordable way to start vermicomposting. Polystyrene can take thousands of years to break-down and biodegrade. Unfortunately a lot of polystyrene products are for single-use only. I love the fact that we can put this eco-unfriendly product into good use. 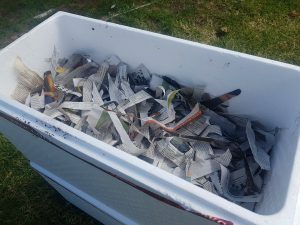 A DIY worm bin made from polystyrene is a recycled and cost effective solution. Polystyrene has excellent insulation properties. This goes a long way to help regulate worm bin temperature. It is also light and easy to cut which makes it great to work with. DIY worm farm made from polystyrene broccoli boxes. It’s easy to spend > $100 USD on a pre-made free standing worm bin. Add an extra $50 USD – $80 USD for compost worms and $20 for a worm blanket to cover them. And it can get quite expensive. If you’re uncertain whether worm composting is right for you, then a DIY worm farm is a low-risk investment. All required materials sare obtainable at no cost. Under favorable conditions, composting worms double in population every 60-90 days. So if you know somebody who owns a worm farm, grab a handful of compost worms to breed them up. You can get some polystyrene boxes from any fruit and vegetable shop. They will be more than happy to give them away instead of seeing them end up in landfill. A broccoli box is perfect for a home-made DIY worm bin. If DIY is not for you, then check out some of our comprehensive reviews to find the best worm composter. This include the almighty Hungry Bin. The design of a DIY worm bin made from polystyrene boxes is pretty straightforward. An upper box is the working box where your worms will live and feed. The upper box sits on top of a lower box. The lower box collects liquid which drips through some holes made in bottom of the upper box. 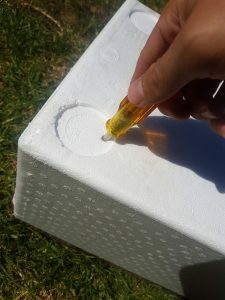 The design of a DIY worm bin made from polystyrene boxes. To make it easier to harvest worm tea, you can install a tap / spigot to the lower box. A lower box is unnecessary if you are able to manage the moisture. For example, adding lots of fresh bedding material will absorb any excess moisture. And adding high water content foods will increase the moisture. However if you don’t have a lower box, you will miss out on any worm farm leachate. Polystyrene (or styrofoam) is a poor breathing material as it’s plastic. Optionally, you can drill some holes into the walls or lid to provide air ventilation to your bin. You could also cut a larger section of polystyrene and cover the gap with fly screen mesh hot glued on. 1,000 compost worms or a big handful of compost worms. Compost worms are not the same as ordinary earthworms you may find in your garden. You can buy compost worms from your local hardware and garden store or online. The assembly of the worm bin is super easy and only takes a couple of minutes. Step 1: Take the two polystyrene boxes with lids. Put one lid aside as only one lid is needed on the top of the upper box. Poke some holes through the bottom of the upper box. This allows any excess liquid to collect in the lower box. Step 2: Poke some holes through the bottom of the upper box. I used a screwdriver to do this. This will allows liquid to drain down into the lower box. Make sure to add some holes in the corners in case your worm farm is on a lean. Step 3: Line some mesh or shade cloth inside the upper box to cover the holes. This will prevent your worms from falling out. Step 4: Since polystyrene is as bad a breathing material, punch some air ventilation holes into the lid or sides of the box. Optionally you could cut a good section of the polystyrene and cover it with some fly screen hot glued on. Step 5: Prepare the bedding material. Add a bucket or aged compost, coconut coir fiber or garden soil into the upper box. Add a good amount of fresh bedding material on top. Prepare the worm bin with bedding material such as garden soil or aged compost. Step 6: Add some water to dampen the bedding and to ensure the drainage holes work. Optionally you can add a tap / spigot to the bottom box. Step 7: Add compost worms and cover with a worm blanket or other material. Let the worms settle in for a couple of days before adding any food. Step 8: Sit the upper box box on top of the lower one. Optionally you can place a couple of bricks inside the lower box to make it more sturdy. Go upwards to increase the capacity of the worm farm. Add another polystyrene box on top, creating a multi-story worm farm. The worms will slowly migrate up through the holes into the box on top which has fresh bedding. This allows your compost to age and breakdown even more. Once the box on top is almost full, you can harvest the worm castings in the bottom box. The boxes are then switched so that the empty box becomes the new top box. Make some room inside the box. Move some of the worm castings to one side and then add some fresh bedding to the other side. Most of the worms will move to the fresh bedding. 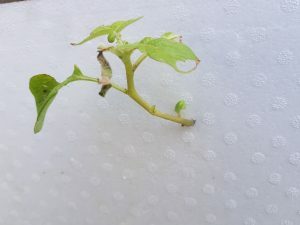 After a few days you can remove and harvest the worm castings. 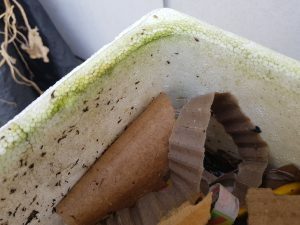 Green mould has stained the inside of the polystyrene box. The DIY worm farm is working well. It’s not as active and efficient as my Can O Worms however. The worms don’t seem to be eating as much and the worm population has not increased as fast as I would have liked. I like how DIY worm bins are cheap to scale. 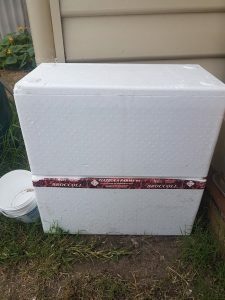 I decided to create a second DIY worm farm using polystyrene boxes. This one is a bit wider which is better. A greater surface area adds more oxygen and also makes it easier to spread food scraps. A plant has sprouted and punctured a hole through the sides of one of my DIY worm farms made using polystyne boxes. A plant has surprisingly punctured it’s way through the side of one of the boxes. Some green mould has stained the insides as well. Polystyrene is a fragile material. Some small pieces have broken off when handling the boxes. The longevity of DIY polystyrene worm bins comes into question. I can’t see it lasting more than 1-2 years. Harvesting is not very practical. Every time I want to access the worm tea, I have to move the top box which is heavy to lift and awkward to maneuver. Commercial worm bins are less work to harvest the worm castings.